1. Under Linked server ->MSDASQL properties, check “Non transacted Updates” check box in SQL server as shown below. 2. Reference table names in all queries using four-part naming structure. DBPronto v3.96 has now been rebuilt with Java 8 to resolve a problem with the server not starting when using the Web Administrator. If you still wish to use your older version of DBPronto with Java 8, then replacing the gwt-user.jar files should do the trick. A number of issues have also been fixed, a full list can be found in the FlexGen release notice. The FlexGen documentation has also been updated as is available for download. Please contact TransoftUKSupport@advanced365.com if you have any questions regarding this release. U/SQL Release 5.20 is now available. Previous versions of U/SQL ODBC Client is not supported on these platforms. To use 64-bit DSN it is mandatory to install Visual C++ 2010 Redistributables. U/SQL now supports SSL Encryption, contact Transoft Support with your platform requirement. This feature establishes a secure communication between U/SQL Server and U/SQL Client preventing interception of critical or sensitive information across the network and other internet communications. The software used is OpenSSL on Unix and SChannel on Windows. U/SQL now supports Microsoft ODBC (open Database Connectivity) access to RMCobol Data files. Please contact Transoft Support for further Information regarding platform availability. Support for Transoft DBIntegrate Change Data Capture (CDC). Contact Transoft Support for information about our DBIntegrate product, you will need this product to implement this feature to capture data access events on your U/SQL RMCobol data source via Win Usqli (Windows) or Usqli (Unix). Please find full release notes available on our FTP site in downloadable PDF format. A full list of platforms it is released on, is available on our website, on the U/SQL Current Releases Page. If you have a platform requirement that isn’t listed please get in touch with Transoft Customer Support or your Account Manager as U/SQL can be built for specific platforms on request. This error occurs when the U/SQL Server fails to load a required library (Unix System) or dll(s) (Windows). This can happen if you are using a udd developed with a different U/SQL data source driver such as using a udd developed for a MicroFocus Cobol driver, but using a U/SQL Server with a different driver. The most common occurrence of this error is in U/SQL Servers accessing Acucobol VISION files on a Windows Server. The U/SQL Server requires two Acucobol dlls; acme.dll and avision5.dll, be loaded in order to open VISION files. These two dlls are commonly found in the Acucobol ACUGT bin installation folder. 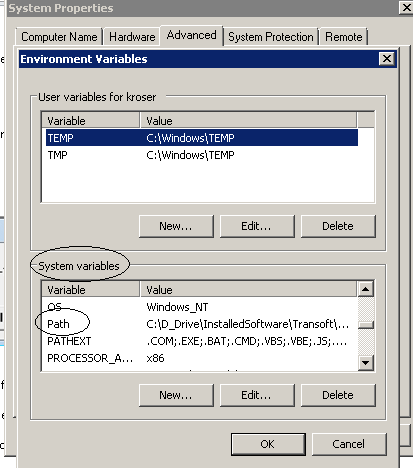 You must include this folder in the PATH environment variable for the SYSTEM, and they must be on a local drive (not a mapped drive) on the PC running the U/SQL Server. Make sure you add the Acucobol bin folder to the System Variables section of the environment (not the User variables section) so that it will be available to the U/SQL Server at startup. Here is a short visual guide on how to create Users on your PC, using the Administrative Tools and Computer Management windows. We hope you find this useful, as it is not covered in the user guide at current. We have not produced a specific version of our U/SQL Single-tier product for the 64-bit environment, but have added the licensing to the Multi-tier product to restrict it to local-host access. People who are currently using U/SQL Single-tier on 32 bit windows can continue to use U/SQL Single-tier on 64 bit Windows in order to access data from any 32 bit application. If Clients using U/SQL Single-tier wish to move to 64 bit Windows and want to access U/SQL data from a 64 bit application, for example MS Office 64 bit, then you will need to install U/SQL 5.10 Multi-tier and get a license that limits to local connections only. The U/SQL Server would sit on the same machine as the 64-bit Client. This would be priced as a platform change to the single-tier product. If 64 bit Windows applications access U/SQL data via the 64 bit U/SQL Client, the client license will need to be upgraded to “W64” to allow 64 bit connections, this would be priced as a platform change on the client side. We are very excited to bring you the latest release of DBIntegrate, V.3.1.7.3 – this release incorporates minor bug fixes (of which a full list can be found here: Release Notice) and our new functionality Address Cleansing Functions. The new Address Cleansing functions allow users to easily clean addresses, returning output based on a combination of user functions. The total package incorporates 42 new functions which are installed by default with DBIntegrate, and additionally a new SQLite database is installed, and added to the Transoft.udd as “AddrCleanse”. This database contains tables for abbreviations, county, US States, UK towns, street suffixes amongst others. The data can also be modified and enhanced to meet any additional or tricky business rules and requirements. The solution offers two paths to take, one for those with access to the Royal Mail PAF Database (for UK addresses only) and the second for those without. The quality of returned results will be enhanced via access to the PAF database as results are validated against a fully documented database. Although the primary focus of these address functions are been based on validating UK addresses, the functions also incorporate features for US addresses, and others from the rest of the world. If you would like to know more about these don’t hesitate to contact us. A demo of this functionality will soon be available on our DBIntegrate YouTube playlist. We recently had a customer getting this in a message box when trying to set the Authenticator in UBL Administrator. After some investigation, it was found that the use of the quote character in Group names (in Computer Management -> Local Users and Groups -> Groups) was causing the error message to pop up from deep down inside Microsoft active directory code, so we can’t say exactly why it doesn’t like it. Removing the character fixes the problem. HP have released an updated OpenVMS roadmap (www.hp.com/go/openvms/roadmap), this details plans for support and engineering of the VAX, Alpha and Integrity versions of HP OpenVMS. HP will sell Integrity i2 servers for OpenVMS until at least 31st December 2015. HP will sell Integrity i2 server upgrades until at least 31st December 2016. HP will not be making OpenVMS available on Integrity i4 “Poulson” servers. OpenVMS v8.4 on Alpha will be in “standard support” status until 31st December 2016. OpenVMS v8.4 on Integrity will be in “standard support” status until 31st December 2020. We can establish that the end is near for HP OpenVMS, as such suitable plans should be prepared. You can make a start by downloading our free white paper about determining the best approach to the Open VMS end-of-life period: OpenVMS Transition Options.